Without yeast, our lives would be void of many of our day-to-day products. Getting back to the basics and learning how to make yeast yourself will give you an invaluable skill to hold onto and share with others. Using different produce such as oranges, potatoes, herbs and grains is not only a great science experiment, but a way for you to play around with the flavors of your favorite bread recipes. Where would we be without the discovery of yeast? Fresh, puffy bread would be non-existent, and need I not mention the fact that beer, wine and alcohol products would cease to exist. Of course, all yeasts were not created equal. Some yeasts are made for making bread and baked goods, and some yeasts are made for distilling spirits. Knowing ways of making this essential prep would be beneficial to anyone trying to live off of the food supply they have. 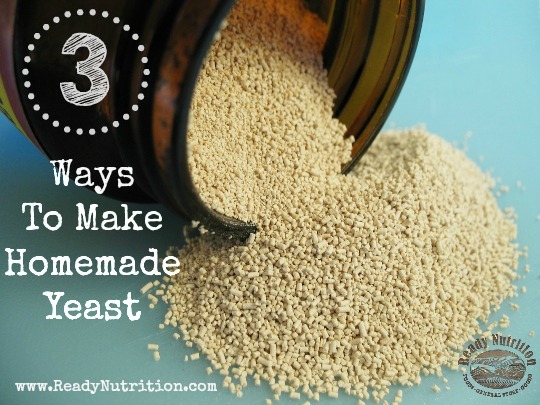 Grains, vegetables and fruits are three of the easiest ways to find yeast. Some have even used herbs to get their yeast. Did you know that yeast is actually alive on plants? As long as it has warmth, moisture, and food to grow, it will stay alive. Fruits, vegetables, herbs, and all edible sources have yeast living on it’s surface. As a result, using different produce will add to the flavor of the bread you make. Simply by soaking the produce in water, you can separate the yeast and use the water it is floating in. The water and yeast actually start the fermentation process that when mixed with flours creates that desirable baked good we love so much. This fermented concoction is also called a bread starter by some. By using this method, however much water the recipe calls for is how much water to soak the fruit, vegetable, herb or grain in. Those that have used this method rave about raisins as being one of the best fruits to use for acquiring yeast. Because yeast is already present on grains, when combined with water, the yeast will separate from the grain. As a result of the soaking process, the combination will begin to ferment. Mix flour and water in the jar and let stand until the batter bubbles and rises. This may take anywhere from overnight to a week! Wild yeast naturally lives on potatoes, as well, making this a popular choice for making distilled spirits, such as vodka. According to the article,”Homemade Yeast: Making and Using Yeast For Bread,” the author states that using potatoes to make yeast starters dates back to 4,000 B.C. Boil potato in the unsalted water until done. Drain, but save the water. Mash potato then add sugar and salt. Cool to lukewarm, add enough potato water to make one quart of mixture. Cover and set in a warm place and allow to ferment. Note: If the starter is not rising, you can add a package of store bought yeast to speed up the process (but it will be just as good if allowed to ferment without the added yeast). This recipe is about right for a large family requiring more than one loaf for baking. Boil potato, drain and save potato water (unsalted). Mash potato well, and then add potato water, sugar and enough flour to make a fairly stiff batter or soft dough. Keep in a warm place until fermenting process is complete. Put mixture in a wide mouth jar and cover loosely–never use a tight fitting lid. In about five or six days it should be ready. Many fruits can be used to make yeast for bread. Oranges, apples, grapefruits, grapes and even dried raisins all have traces of yeast on them. Using yeasts from fruits will create different flavors to the breads that you make. Skins of fruit can be used as well as cores of apples and even tomatoes. The only fruits that should be avoided are kiwi, pineapple and papaya. These fruits contain actinidin, an enzyme that breaks the dough down and it creates a sticky mess. Place raisins in clean jar and pour bottled water into the jar until it is 80% full. Loosely cover the jar and leave at room temperature. This process should take a few days. You will notice small bubbles and “activity” occurring inside the jar. At this point, all the raisins should be floating at the top. The jar should smell like wine. Once it is done, store in the refrigerator. *Tip: Adding 1-2 tablespoons of honey or sugar to your mixture speeds up the fermenting process and leads to a better result. Can you freeze a yeast starter? I was given some starter by a friend once to make Amish Friendship bread, the theory being that you use some of the starter to make your bread, divide the rest, keep half and give the other half to a friend so they can do the same (the starter will double itself if I remember correctly). So, my question then is, will the starter freeze, essentially making it ‘dormant’? If so, making a lot of starter then maybe freezing it in ice cube trays or something similar, wouldn’t be a bad idea. Absolutely! You can even freeze yeast and thaw out the amount that you need. Once thawed, the yeast will become active again. There are a lot of people that freeze the yeast water starter (that I discussed in the article) in ice cube trays. It helps them keep a better measurement when they are thawing it out. Happy baking! dont freeze it just stick it in the refrigerator. it will stay dormant in the there and when you want to use it take it out and let it warm to room temp and feed it. In the past I have found to my embuggerance that if the fridge is over 4 deg c it can grow and contaminate your entire unit. Yes I have in the past. I particularly like the Hovis strain for this , yep the famous bakery has it’s own yeast . As does Carlsberg come to think of it. Can you do this with a bread machine? How much starter would equal 2 1/2 teaspoons of dry bread machine yeast? It would be a lot cheaper to make my own yeast. As far as I know, bread machine yeast and regular yeast can be substituted for eachother in bread recipes. So whatever measurement of yeast the recipe calls for, add the same amount. From the research that I have done on yeast, the yeast that we buy at the store is essentially the same type of yeast that lives on the fruits and vegetables that were discussed in the article. The only difference is that bread baking yeast typically has absorbic acid added to it. Absorbic acid conditions the dough. Start experimenting with making your own yeast and see how it goes! Now is the best time to figure out what works for you. Let me know how it goes! You can also dry your starter by spreading it thin on a glass pie dish etc. and leaving it in a cool, dry place for a week or two. break it up and store it in the fridge. Warm water to rehydrate and a day or two to aclimate and it’s good as new. Can you dehydrate yeast with a dehydrator?? I don’t believe that you can dehydrate yeast. Yeast needs a certain environment to stay active and dehdyrating it will kill them. Thanks for your comment. PS: yeast becomes inactive if dried or cooled. If left without water for about a year, it will die. If frozen in temperatures too low for that strain, it will die. it will most easily die from heat. Most yeasts are comfortable around room temperature, but some can take hotter temperatures. No, yeast IS NOT bacteria! I definitley agree. Too much misinformation here to be worthy of sharing. So what is packet yeast if not dehydrated? In the potato example, why doesn’t the boiling process kill the yeast? I had the same question! However, from what I can gather, the liquid from boiled potatoes attracts the wild yeast. The liquid yeast and can be kept bottled in a cool place for up to 3 weeks. The boiled potato are perfect food for yeast so airborne yeast will get onto it and start eating the potato mash. I have just started 2 yeast cultures. 1 flour and 1 potato. My question is, after fermentation, do you simply scoop it off the top or use the entire mixture? I have about a half a cup each in a couple of pickle jars. Thanks. RD, stir that starter up and use a cup or however much you need from the whole mix, not just the “fluff” on top! I read online that if you transfer your starter to a new jar, you can start a new one in the original jar without washing it… the leftover drops will help the new one get going. Yes, you can dehydrate yeast by make little cakes of starter and drying to small hard cookie shapes. Found this in a book up in Alaska called the “Alaska Sourdough” cookbook. Pioneers if traveling on foot, horseback, or dogsled had to think of lightweight storage and breakage thus the dried yeast cakes. All you have to do to is reconstitute by adding lukewarm water and sit a bit before starting recipe. Hope you finds this helpful. yeast is a beautiful creature. Is it okay to use a plastic container instead of a glass jar? I am not sure whether plastic or glass is better for the yeast. Why not do an experiment and try it in a glass jar and plastic to see which results you like the most. I have some questions. How big of a jar do I use and how much of the yeast water do I mix with the flour and what about the rest of the water? A little confused but very anxious to learn. Hi everyone ! I am so happy I found this info. Actually thought about making yeast naturally a few days ago to make my bread experiments, since I am new to baking bread. I made one using barley grains, purified water, sugar like 2 spoons ( I think is was too much though :), the other one I dis with 2 Tbs of bread flour , 1 or 2 Tbs of sugar and purified water. I put them in a glass covered with the plastic wrap. Today was the third day or 4th I don’t know. I think the third, anyway the barley had big bubbles like soap and I used it to make dough. I didn’t warmed it up in the microwave or stove because I was afraid to kill it. I made the dough and is resting . I don’t see it rising yet. I did a small piece in the oven just to see if it raises but it didn’t since I just let it rest for about 20 minutes lol! But the taste was pretty good. The flour one has small bubbles so yesterday I added barley grains and today was bubbling more but I want to make sure that really bubbles up so I don’t get my usual hard like a rock bread. Thank you for giving me an advice to make soft crunchy bread by hand and using the starters. is it okay what I did? Thank you. Much love for all the bakers. Yes, Ruby…there is a lot of good information here! You are right about being careful not to kill the yeast with too much heat…I believe anything over 120f …am sure someone will correct me. ha ha It does take much longer for the dough to rise…I sometimes set mine on the stove over a pan of hot water and it works for me…some people preheat their ovens to 275 degrees and turn it off…then put your bread in…you really can’t rush the rising process…but you do need to keep the dough warm so the yeast will stay active. Good luck & let us know how it turns out! you experiment , you did good. ! I have never tried boiling the potatoes to make a starter…but my recipe for makeing the potato yeast bread…says to pour boiling water over raw potatoes and let set overnight…using the potato water to make the sponge. This recipe was handed down to me from my mother and grandmother who were pioneers in OKlahoma and Texas…in the 1860’s/70’s. Oh! I forgot! And they added a handful of HOPS! HI Everyone, this is the recipe I used for my potato yeast starter Ingredients: 2 large potatoes boiled, 2 cups white flour, 4 cups water, 2 tablespoons active dry yeast, 2 tablespoons white sugar. Directions: Cover potatoes with 4 cups of water, cook until tender , Pour 3 cups of potato water into bowel set aside, Peel and mash potatoes until smooth. cool potato water to room temperture. In blender place flour, yeast, sugar and mashed potatoes, add lukewarm potato water blend till smooth. Proofing(fermenting) Place starter in 1/2 gallon glass or plastic container, cover container with plastic wrap and pierce with fork to allow gas to escape. Place in warm draft free ares 2 to 3 days; stir several times daily(do not let your starter rise above 95 degrees). After the 3rd day refrigerate and cover with tight lid (not metal) until ready to use. (do not stir your starter with a metal spoon). Feeding your starter: for every cup removed from your starter you will need to add back to starter 1 cup flour, 1 cup lukewarm water and 2 tablespoons sugar. Let stand 12 hours or overnight at room temperature before refrigerating again. I have made some very delicious white and wheat bread with this starter. Warning: if your starter turns purple, grows mold, or has a very bad odor toss it do not use. Use your starter at least once a week and feed it to keep it fresh or it will go rancid. I also tryed drying the starter at room temperature it did not take, will have to experiment with that a little more. I forgot to mention that you need to bring your starter to room temperature before making your bread. Cathy: Do you have the complete recipe for the bread, using your yeast starter? I am starting my yest starter , but am confused as to the ration of starter in a recipe. I always use the same recipe for making my white or wheat bread, however i am sure the ratios are a bit different using the starter? How do I substitute the yeast starter into this recipe? If anyone has any ideas, please let me know. Thank you. It depends on what you want to make the starter yeast from. In the article I suggested three different ways of catching the wild yeast. Try each out to see which method is best for you. The first yeast starter I made was with raisins. All you need is 3-4 tablespoons, a jar and some bottled water. Allow it to sit undisturbed for a few days. When you begin seeing bubbles or activity then you know that your yeast cultures are present. Thank you for this. I love learning how to be less dependant on commercial sources. We have 7 Herman the German Friendship cakes growing on our dining room able at the moment. Ahhh Yeast! I wouldn’t use instant. I believe those will not have an adequate amount of natural yeast one them. You might want to stick with the real ones. You can, but brewer’s yeast is preferred in making wines and beers. I’m wondering if I can use organic dry yeast to make a fresh yeast product. I’m actually interested in making something high in b vitamins for my organic dairy goats! B vitamin supplements are just too expensive for 9 goats. All the supplements I can find to purchase are crazy expensive and they always add things I don’t want to give my goats (even the organic ones) Any ideas? Hi, I m trying to make fruit yeast water with peeled , diced apples . As soon as i add water to apple slices , the apple slices float. Some part of the apples are not inside the water . Is it normal ? Do i have to turn the apple slices upside down everyday? You can stir it every few days to ensure that all sides have been submerged in the water. You will most likely see activity in about 3 days or so. i try the fruit yeast, can i keep the leftover alive and grow more. if so how do i do it??? How do you know how much to use of the starter for your bread recipe? I’m really interested in making my own yeast starter. I can’t find organic active dry yeast anywhere. I’m confused though. I can find various sites talking about how to make a starter but how do I use it once it’s ready??? No one seems to explain this although I do see one commenter said 1 cup of starter would require a reduction of the flour and water in a recipe by 1/2 cup each. I assume this is for the starter made with flour?? What about one made with raisins? Why does the raisin starter require bottled water and the grain starter uses any water? I could not find the answer in the comments…….so how much flour do you use ? the recipe states 1 1/4 but does not say whether its spoons or cups. I know it’s been 4 years, but does it make sense to boil the potato you’re trying to grow yeast from? Not to me. Boiling kills yeast. When you make the yeast, is it alive or dried? Yeast isnt a fungi or bacteria. Yeast is yeast…. Wouldn’t boiling the potato kill the yeast on it? This is stupid. you say “did you know that wild yeast grows on potatoes” but in both recipes you boil the potatoes and kill all the yeast. This means you are just using the mashed potatoes as food for yeast in the air and not actually using the yeast on the potatoes.